This Article applies to Print Manager Plus 9.0. Preface: This document applies to PMP installations using the default SQL Express database that is provided with the product. These steps may not apply to setups where a remote database or shared database is being used. In those cases, please consult your DBA on the best practice for moving your database as this is beyond the scope of this document. Since the Print Manager Plus database structure can vary between versions, it is important that when moving the database, the source version of Print Manager Plus is the same as the one being installed. The easiest way to do this is to upgrade to the newest version first. The easiest way to update is by using the eUpdate system to upgrade to the newest. This can be done within File > Check for Updates. Method 2: Obtain a full/upgrade installer from support. If you need the latest install files please send an e-mail to worldwidesupport@printmanager.com with your company name and License Key. Install the newest version of Print Manager Plus on your new server. You can use your existing key, but note that only one installation of PMP will operate per license. b. Finish the install and restart the print server. 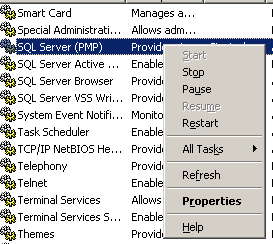 c. Stop the SQL service on the new server. d. Replace your database files on the new server with the files from your old server. They should be already named the exact same on both systems. e. Start the SQL service on your new install. f. Restart the Print Manager Plus Service and Program on your new server.